The BBC's Apollo 11 team: (From left) Patrick Moore, Clive Michelmore and James Burke. IT was a small step for a man, but a giant leap for the viewing public in July 1969 when they followed history in the making from the comfort of their sofas with Apollo 11 – the BBC’s coverage of NASA’s mission to land men on the Moon. The Sky At Night presenter Sir Patrick Moore views the Apollo 11 mission as the most exciting event he ever reported on while fellow Apollo 11 presenter James Burke has described it as “The greatest media event of all time”. "The greatest media event of all time": The Apollo 11 mission. In total, the BBC featured 27 hours of coverage of the Apollo 11 mission over 10 days, from July 16th – 24th, across BBC1 and BBC2 (with the BBC2 material in glorious colour). 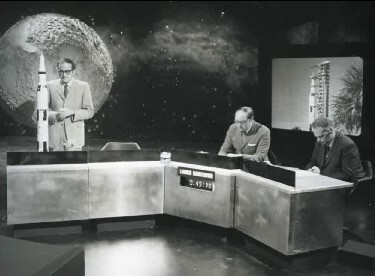 The programmes were presented by Cliff Michelmore, with James Burke and Patrick Moore focussing on the science behind the mission and technical analysis. In America, Michael Charlton reported live from Cape Kennedy and Houston Mission Control. Each day of the mission there were a number of different programmes of varying lengths to keep viewers up-to-date with what was happening. There were broadcasts from the Apollo 11 space studio at Lime Grove with longer programmes to cover important events such as the launch, undocking and landing, and shorter ones for progress reports. In addition there were Apollo 11 bulletins on BBC news, children’s television and Twenty-Fours Hours, a current affairs show. For the night of the Moon landing, both the BBC and ITV made British TV history by screening the nation’s first all night broadcasts, remaining on air for 11 hours from 11.30pm, July 20th to 10.30am, July 21st. 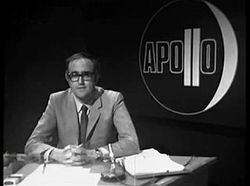 One minute of video footage of James Burke reviewing the Apollo 11 launch on July 16th, 1969, on the Twenty-Four Hours programme. A 20-second clip of Patrick Moore and James Burke in the Apollo 11 studio on the evening of July 20th, sourced from an amateur off-air recording donated to the BFI in the mid-1990s by Graham Briddon. 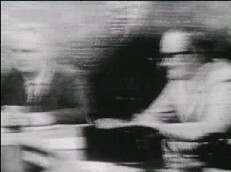 A still from the 20-second clip featuring the only known footage of Patrick Moore and James Burke together in the Apollo 11 studio. Filmed inserts presented by James Burke, featuring him inside the Apollo Command Module, demonstrating the Apollo Saturn 5 rocket emergency precautions, demonstrating the Luna EVA suit and experiencing weightlessness training. A colour presentation from Houston Mission Control by Michael Charlton on video tape. Some BBC News bulletins by reporter Reg Turnill. 8mm off-air home movie footage showing some captions superimposed over pictures from Mission Control – this has not been positively identified as BBC footage. A low-fi 16mm film recording from the collection of Vaughan Stanger taken from a video recording and donated to the BFI in the mid-1990s. It features footage of the splashdown, the lunar module and the first live pictures from the surface of the Moon. A home video recording from the collection of Bob Wallis, discovered in 2000. This is the tape that is reported elsewhere as unplayable. In fact, the BBC’s Paul Vanezis HAS played it back. It features an episode of Tomorrow’s World concerning Apollo 10 and the repeat of the Moon walk (satellite feed only) at 6am on July 21st. The Sky At Night producer Paul Vanezis has previously gathered all extant BBC material together for the brilliant 2006 special on Apollo 11, A Night To Remember. In just under two hours, the programme gives the viewer a real feeling for what the BBC broadcasts must have been like, by interspersing the surviving clips with pictures from the satellite feed married to recovered off-air audio recordings of commentary by the Apollo 11 team. “The BBC coverage of the Apollo 10 mission is the last to have retained the PasB recordings. With all PasB material beyond Apollo 10 someone must have decided what the BBC was going to keep – the material of best future use. 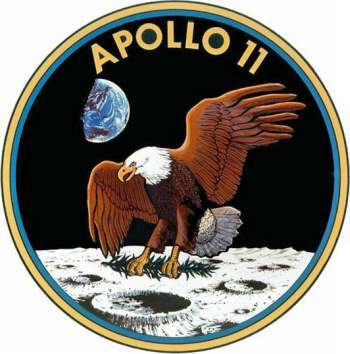 “From what people have told me or from what I’ve worked out from what actually survives, there must have been an ongoing series of recordings of PasBs of Apollo 11, added to recordings of the actual material coming from the satellite feed (a lot of which exists). The BBC's Apollo 11 Studio. “Recordings were definitely made and I imagine they were quite comprehensive. Perhaps not all but at least some of the live bulletins – most of which were only five or 10 minutes long and which went out at odd times – would have been recorded. But at some point they were physically wiped. Someone went through them and decided to keep certain things. For example, there still exist three satellite feed moonwalk tapes all on 2” tapes. Those were recordings made in the early hours of July 21st of the actual Moon walk, done on two machines. The first reel was done on one machine, then there’s an overlap on the recordings as it transfers to the second machine, and then another overlap back to the first. The tapes were replayed at 6am with fresh live commentary from James Burke and Patrick Moore and those PasBs including the commentaries were probably recorded as well but weren’t kept. So the captions from the PasBs saying “Live from the surface of the moon” or “First man on the moon” don’t exist, but the recordings from the satellite link do. “For A Night To Remember we used as much as we could that was useful. Being limited to a two-hour duration, the idea was to re-create in the minds of the viewer the same anticipation of the mission as there would have been back in 1969. For example, with the launch we could have just said the rocket had taken off but we wanted to give the idea that the rocket is GOING to take off and is counting down, So we started five minutes before blast off. That’s also why we had 20 minutes of moon walk. “We shortened several things because we didn’t have the footage to visualize what happened. Not all the film inserts seem to exist. There’s an insert of James Burke doing weightlessness training on a wooden rig suspended sideways done to “What Goes Up (Must Come Down)”, but it was too poor quality to use. There are also two versions of the Luna EVA space suit film and the version put on A Night To Remember is the long one, originally used for the Apollo 10 coverage. There was an edited version for the Apollo 11 broadcast but it was so awfully edited I decided to use the long one. It’s a slight cheat but at least the viewer got to see the insert as it was meant to be seen. “The Saturn 5 escape film insert was actually transmitted during the launch programme and the launch, moon walk and splashdown recordings in A Night To Remember parallel identically with the recordings of the satellite feed on the PasBs, though I had to re-instate the astronauts’ breakfast footage in the launch footage from the NASA tapes. I was able to marry up the Apollo 11 audio with the satellite feed. Regards Michael Charlton talking about lunar trips, it is identical to how it appeared in ’69. “Quite a bit of the Apollo 11 audio exists and in fact we’ve found a lot more recently from amateur line recordings. James Burke reviews the launch of Apollo 11 on July 16th. Thanks to off-air audio recordings, much of the Apollo 11 commentary still exists. got the soundtracks for the 15 minute programmes for BBC1 and 2. Concerning the 1.50pm -2pm 10-minute programme, we’ve got sound and video tape inserts from the satellite feed. The 19th 00.30am Target Moon we don’t have but we have got the inserts and live commentary for the 1.30pm 10-minute Apollo 11: Man on the Moon programme repeat. The situation is the same with the 15-minute programmes at 2.45 and 6.15pm. “On the 20th we have some of the pictures from the command module and for July 21st we have the live footage from the surface of the Moon broadcast on the BBC at 3.20am and the Apollo 11 studio soundtrack. Vaughan Stanger’s film recording has all sorts of things on it including a big chunk of the first live pictures from the surface of the moon with a shot with the caption ‘Live from the surface of the moon’, but it was too indistinct to recreate. His film recording seems to have been from a domestic recording and it’s a shame we can’t find the video it was made from, though it would probably be unplayable now. “Bob Wallis’ tape, found about 10 years ago, contains the 6am repeat of the Moon walk footage and though the visual quality is appalling, the sound is OK. The label on the tape only says “Apollo 11” so people have assumed it is hallowed missing material. There are two points to bear in mind. The first is that the actual 6am PasB repeat of the landing on the Moon does exist – the BBC never wiped it. The second is that Bob’s tape has two programmes on it: One an episode of Tomorrow’s World about Apollo 10 where we had the film inserts but not the studio footage, and a short section of the Apollo 11 Moon walk. It never gets into the studio with James Burke and Patrick Moore so there’s nothing on it we haven’t already got. “The funny thing about that 6am repeat, which has the on-screen caption “Recorded earlier”, is that the commentary doesn’t actually make sense. James Burke is pretty much left to fend for himself as Patrick Moore is so engrossed with what’s going on. Whenever James says anything to him, Patrick replies “It’s too early to tell”. When I asked Patrick about his commentary he said it was 40 years ago and he couldn’t remember what he said but I was actually able to tell him he didn’t say anything really! Neil Armstrong's one small step for a man was broadcast around the world via a satellite feed. “I think if we didn’t have the audio it would be quite a tragic loss as we simply wouldn’t know how the broadcasting team reacted to that amazing event at the time. In that respect the audio is very important but I’m particularly pleased that the Michael Charlton sections and the James Burke inserts survive on film because they do give us a really good feel for the atmosphere at the time and what was happening. I’m less concerned about the loss of the studio material as the Apollo 10 programmes used the same studio so we know how the studio looked like as it didn’t change between Apollo 10 and 11. You can currently see A Night To Remember on the BBC website here. A poor quality 20-second clip of Patrick Moore and James Burke in the Apollo 11 studio, sourced from an amateur off-air recording. Filmed inserts presented by James Burke, featuring him inside the Apollo Command Module, demonstrating the Apollo Saturn 5 rocket emergency precautions, demonstrating the Luna EVA suit* and experiencing weightlessness training. A film recording from the collection of Graham Bidden taken from a video recording. It features footage of the splashdown, the lunar module and the first live pictures from the surface of the Moon. A home video recording from the collection of Bob Wallace, discovered in 2000. This is the tape that is reported elsewhere as unplayable. In fact, the BBC’s Paul Vanezis HAS played it back. It features an episode of Tomorrow’s World concerning Apollo 10 and the repeat of the Moon walk (satellite feed only) at 6am on July 21st. Sky At Night producer Paul Vanezis has previously gathered all extant BBC material together for the brilliant 2006 special on Apollo 11, A Night To Remember. In just under two hours, the programme gives the viewer a real feeling for what the BBC broadcasts must have been like, by interspersing the surviving clips with footage from the satellite feed married to recovered off-air audio recordings of commentary by the Apollo 11 team. To coincide with the 40th anniversary of NASA’s mission to the Moon, Paul spoke to Wiped about the loss of the BBC’s Apollo 11 coverage, the piecing together of A Night To Remember, and trying to see the bigger picture when considering how much of a cultural loss the disposal of the BBC material really was. “The BBC coverage of the Apollo 10 mission is the last to have retained the PAB recordings. With all PAB material beyond Apollo 10 someone must have decided what the BBC was going to keep – the material of best future use. “From what people have told me or from what I’ve worked out from what actually survives, there must have been an ongoing series of recordings of PABs of Apollo 11, added to recordings of the actual material coming from the satellite feed (a lot of which exists). “Recordings were definitely made and I imagine they were quite comprehensive. Perhaps not all but at least some of the live bulletins – most of which were only five or 10 minutes long and which went out at odd times – would have been recorded. But at some point they were physically wiped. Someone went through them and decided to keep certain things. For example, there still exist three satellite feed moonwalk tapes all on 2” tapes. Those were recordings made in the early hours of July 21st of the actual moon walk, done on two machines. The first reel was done on one machine, then there’s an overlap on the recordings as it transfers to the second machine, and then another overlap back to the first. The tapes were replayed at 6am with fresh live commentary from James Burke and Patrick Moore and those PABs including the commentaries were probably recorded as well but weren’t kept. So the captions from the PABs saying “Live from the surface of the moon” or “First man on the moon” don’t exist, but the recordings from the satellite link do. “The Saturn 5 escape film insert was actually transmitted during the launch programme and the launch, moon walk and splashdown recordings in A Night To Remember parallel identically with the recordings of the satellite feed on the PABs, though I had to re-instate the astronauts’ breakfast footage in the launch footage from the NASA tapes. I was able to marry up the Apollo 11 audio with the satellite feed. Regards Michael Charlton talking about lunar trips, it is identical to how it appeared in ’69. “For the 1.50pm -3pm launch programme, Apollo 11: Target Moon, on July 16th, we have got the film inserts and all the audio. We have nothing from July 17th but for the 18th Target Moon, with the first in-flight capsule pictures, we’ve got the soundtracks for the 15 minute programmes for BBC1 and 2. Concerning the 1.50pm -2pm 10-minute programme, we’ve got sound and video tape inserts from the satellite feed. The 19th 00.30am Target Moon we don’t have but we have got the inserts and live commentary for the 1.30pm 10-minute Apollo 11 Man on the Moon programme repeat. The situation is the same with the 15-minute programmes at 2.45 and 6.15pm. “On the 20th we have some of the pictures from the command module and for July 21st we have the live footage from the surface of the Moon broadcast on the BBC at 3.20am and the Apollo 11 studio soundtrack. Graham Bidden’s film recording has all sorts of things on it including a big chunk of the first live pictures from the surface of the moon with a shot with the caption ‘Life from the surface of the moon’, but it was too indistinct to recreate. His film recording seems to have been from a domestic recording and it’s a shame we can’t find the video it was made from, though it would probably be unplayable now. “Bob Wallace’s tape, found about 10 years ago, contains the 6am repeat of the Moon walk footage and though the visual quality is appalling, the sound is OK. The label on the tape only says “Apollo 11” so people have assumed it is hallowed missing material. There are two points to bear in mind. The first is that the actual 6am PAB repeat of the landing on the Moon does exist – the BBC never wiped it. The second is that Bob’s tape has two programmes on it: One an episode of Tomorrow’s World about Apollo 10 where we had the film inserts but not the studio footage, and a short section of the Apollo 11 Moon walk. It never gets into the studio with James Burke and Patrick Moore so there’s nothing on it we haven’t already got. Nasa recently released “enhanced” footage of the first moonwalk – but I understand that they only had a telerecording to work from as they had wiped their own tapes! Would the BBC’s videotape have provided a better source for restoration or is it too screwed by being converted from NTSC? Your headline photo illustrates the BBC team who presented the live coverage, but surely the “Clive” Michelmore in the photo is actually presenter Cliff Michelmore? On 27th February 2006 Patrick Moore presented the ‘Sky At Night’ special entitled ‘Apollo 11 – A Night to Remember’, which includes an amazing quantity of genuine surviving b/w and colour footage of the mission, largely drawn from American sources but including BBC filmed insert material (location footage) presented by James Burke and Michael Charlton. This programme runs 2 hours, and consists solely of non-studio material. Patrick Mooere does mention at the beginning of the programme that much of the live commentary and discussion from the BBC’s presentation of the moon landings has been lost. Producer Paul Vanezis had pieced together a compilation using all of the surviving BBC location footage from the Cape, segments from the BBC sound archives, and film from the Space Agency’s own recordings. Patrick Moore covered up missing segments with his own narration, specially recorded for this programme (in place of his own, and James Burke’s, 1969 commentary). However, I’ve seen video footage off the U.S. tv networks in other programmes, e.g. on the History Channel, which suggests that the archives of the American tv networks (NBC, ABC, and CBS) have a large quantity of footage of the event. I recall in particular, video footage of US anchorman Walter Cronkite covering the landing. Also, I clearly recall from 1969 that, in the UK, ITV also had quite extensive coverage of Apollo XI. But ‘A Night to Remember’ doesn’t include any of the ITV footage. Granted, Patrick Moore and James Burke are the best remembered presenters associated with Apollo XI, but ITV also had coverage of the mission. If you want to hear extensive audio footage of the Apollo XI mission, checkout my website. It includes links to many hours of NASA’s own recordings, all the way from before lift-off to the splashdown days later. More than 24 hours of recordings (audio only) are featured. I have audio recordings of the Apollo 11 to Apollo 16 missions inclusive, that I recorded off the Beeb as a youngster. I can’t bring myself to get rid of them, but are they of any value? Get in contact and I’ll have a listen to your tapes! You state that “there still exist three satellite feed moonwalk tapes”. Do these cover the entire TV transmission – including TV footage after the astronauts had re-entered the Lunar Module? If so, the BBC may have the only remaining copy. The TV continued well after re-entering the LM and included the astronauts jettisoning their backpacks (PLSSs). Whilst NASA has the full moonwalk in the archives, this later TV footage is not. Only a few seconds of what is known as the “PLSS Jettison” seem to exist as a short clip in a NASA documentary and some cine taken off-screen in Australia where the TV signal was picked up. I do remember seeing this TV live on the BBC – although it’s a long time ago and I could be remembering the PLSS Jettison from a later mission. On the other hand, I may well be correctly remembering the BBC transmitting the Apollo 11 jettision – in which case this may be on this BBC recording…. Even the recent NASA release of the enhaced Apollo 11 EVA footage notes this TV is missing and shows the Australian off-screen cine film as the ‘only know copy of this footage’. It would be a wonderful find if it is on the tape. Apologies for taking so long to get back to you. I’m afraid that the BBC’s recording wasn’t direct, but via NASA and was not transmitted over the satellite network, so does not appear on their tapes. Let me know if you’d like to see what’s there. Sorry for my delay in responding. I would love the chance to review whatever video the BBC still has. In particular, the PLSS jettison, was almost five hours after “one small step”. 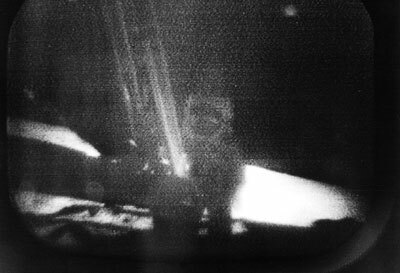 The frustration is we are certain TV was received from the Moon right from one small step through to five hours later, long after Neil and Buzz re-entered the LM when they de-pressurised again to dump equipment including their PLSSs. Most of this TV was an unchanging view of the Lunar Module, but 4 hours and 54 minutes after one small step we saw them dump the PLSSs. Sadly only a short clip seems to survive on video (in a NASA documentary), but this does prove it was recorded. The best surviving footage known about is a hand-held cine clip. If I am correct in remembering seeing this on the BBC, this long-forgotten part of the Moon walk might still be on the surviving BBC recordings. In fact my memory of it was seeing it on a later BBC bulletin, again indicating the BBC had recorded it. Please get back to me to discuss how I can get a copy of the BBC footage to review. I’ve been reading out several of your articles and i can claim pretty good stuff. I will make positive to bookmark your blog. Aw, this was a really good post. In concept I wish to put in writing like this in addition ?taking time and actual effort to make an superb article?nonetheless what can I say?I procrastinate alot and by no indicates appear to get something done. Hello! I basically would like to give a huge thumbs up for the great information youâ€™ve here on this post. I may possibly be coming back to your weblog for more soon. Does anyone know what the piece of music was that the BBC played during the Apollo Launches? issued by BBC Records in 1978. “Also Spracht Zarathustra” (Op. 30), composed by Richard Strauss, played by the Berlin Philharmonic Orchestra.